Prado is the Diamondbacks new 3B. He brings with him the ability to make consistent contact and get on base with a low Strikeout rate. Prado had only 69 SO in 617 AB. 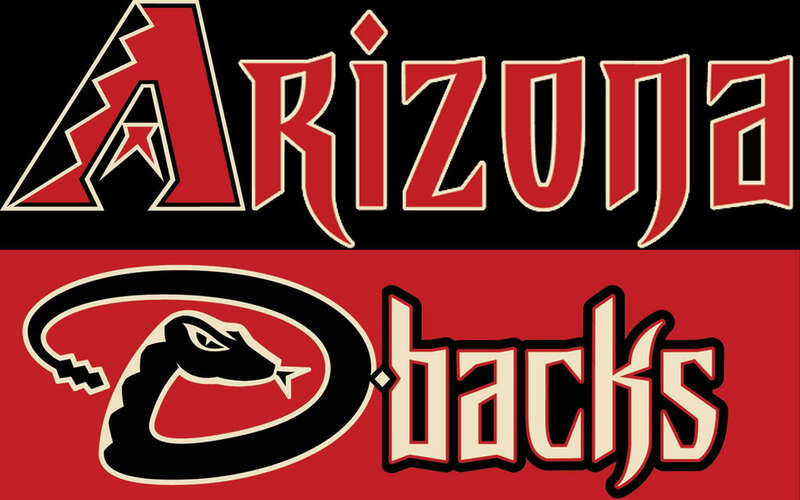 The Arizona Diamondbacks chances of making it back to the Post Season will depend on young Starting Pitcher Ian Kennedy. In the 2011 season he surprised everyone – by having a Win-Loss record of 21-4, to go along with an ERA of 2.88. Kennedy in the 2012 season was not as good as in 2011. One reason for this is that he gave up 28 HRs, by the same token in 2011 – he only gave up 19 HR. The increase in HRs given up caused his ERA to swell by more than a full run to 4.02. Kennedy will once again be atop the Diamondbacks rotation, which as of now figures to include Wade Miley, Brandon McCarthy, Trevor Cahill, and the last spot will be earned by Tyler Skaggs, Patrick Corbin, or Randall Delgado. Wade Miley might have won the NL Rookie of the Year in a lot of other seasons. The NL ALL-Star in 2012 had to settle for 2nd place to Bryce Harper. 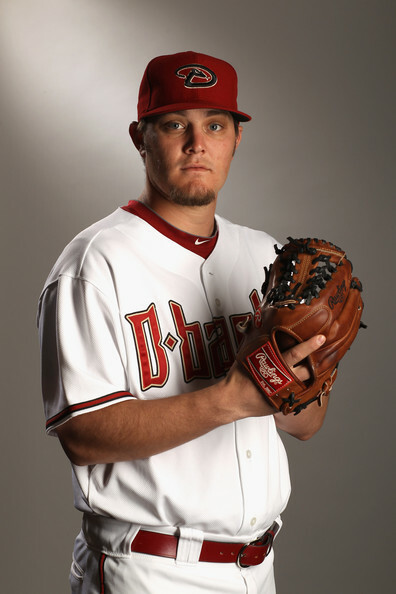 Wade Miley was the surprise standout of the 2012 season with a 16-11 record, an ERA of 2.88; he threw for 194.2 Innings, and finished 2nd NL Rookie of the Year voting. While most of the starters struggled throughout the year with consistency Miley was the lone standout. The success that he had in 2012 is a sign of great things to come from Miley, and he will have no problem holding down the number two spot in the rotation. Brandon McCarthy was signed by the Diamondbacks in the off-season to 2YR/$18 Million Dollar Deal. McCarthy had his season cut short by only making 18 starts. This was due to him being struck by a line drive to his head. The Diamondbacks put him through an extreme physical before he signed to make sure he was healthy enough to pitch. He was having a good season before this happened. The record for McCarthy was 8-6, an ERA of 3.24, and he threw for 111 Innings. McCarthy is known for being a ground ball pitcher, which works well for him pitching in Chase Field. McCarthy is expected to hold down the number three spot in the rotation. Trevor Cahill had his first season with Diamondbacks last season. The season for Cahill had its ups and downs as he struggled with control and location of his pitches. Cahill was still a workhorse making 32 starts. The record for Cahill was 13-12, with an ERA of 3.78, plus he threw for 200 Innings. The main issue for Cahill during the season was that he walked too many batters. Cahill ended the season with a total of 74 BB, and a WHIP of 1.29. This was Cahill’s first season in the NL and I expect it to get better as he learns how to attack NL hitters better with that killer sinker pitch in his arsenal. Cahill will hold down the number four spot in the rotation. 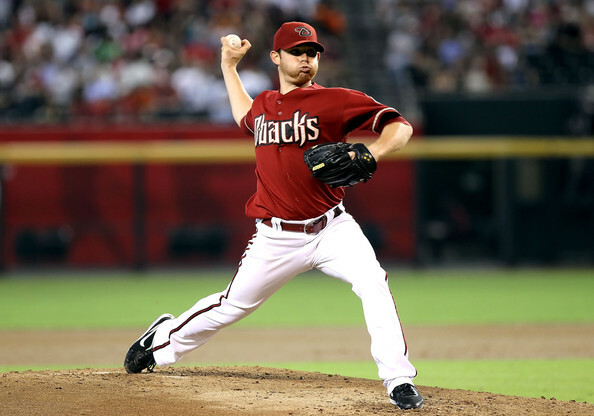 The Diamondbacks have options of who they want to have for the last spot in the rotation. They can go with Tyler Skaggs, Patrick Corbin, or Randall Delgado. Skaggs has the most potential of the three pitchers. He did struggle when he was called up with command issues, but that is to be expected of a young pitcher making his debut. The one thing Skaggs has going for him is that he has a knee buckling curve ball that can get major league hitters out. Patrick Corbin is the most polished pitcher of the group. Corbin was brought up early in the year and made a couple of starts. Corbin was then sent back to AAA Reno to work on some things. Corbin was then called up again in early August and what he worked on while in Reno it helped him out. He was attacking hitters more with his fastball, he controlled the running game better, and handled the bat better when it came dropping a bunt down to advance a runner. Randall Delgado was just acquired in a trade that brought Martin Prado to the desert. Delgado was the Atlanta Braves 2nd best pitching prospect; he went through command issues as well like Skaggs, but he has the potential to be a top of the line starter, but for now he will be competing for the last spot in the rotation. There is one more pitcher who was not discussed but that is because he is recovering from Tommy John surgery. That pitcher is Daniel Hudson; he is expected to be back sometime after the All-Star break. The Diamondbacks feel they are not getting the type of production from the 5th spot in the rotation that they would like they can go with Hudson and let the three other guys mature some more. The Diamondbacks have one of the better Bullpens in the National League and could really shorten games for the Starting Rotation in 2013. 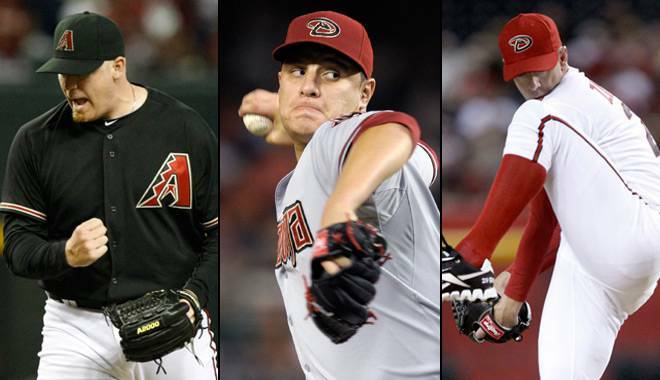 The Diamondbacks Bullpen has some great arms. J.J. Putz, David Hernandez, Brad Ziegler all had a sub 3.00 ERA in 2012. Putz did a great job of being the closer by saving 32 games. The Diamondbacks collectively had a bullpen ERA of 3.28 in 2012. That was good for 10th in MLB, and they held opponents to a .245 BAA which was 18th in MLB. Kevin Towers decided to add some more arms to the bullpen. They brought over Heath Bell from the Marlins by doing a three-way trade. The trade included the Oakland Athletics by trading OF Chris Young for SS Cliff Pennington. They traded for LHP Matt Reynolds by giving away 3B Ryan Wheeler to the Colorado Rockies. The last Bullpen guy they got was Tony Sipp. They got him by trading Trevor Bauer to the Cleveland Indians. Sipp is another Left-Hander they can use out of the bullpen. The previous season he held lefties to a .209 Batting Average. Lineup: Adam Eaton, Martin Prado, Aaron Hill, Jason Kubel, Paul Goldschmidt, Miguel Montero, Cody Ross, and Cliff Pennington. Adam Eaton is competing for starting CF position. He has the tools to play the position, and gives the team a true Lead-off hitter. Adam Eaton will be competing with Gerardo Parra for CF position. Eaton is great because he gives Arizona a true Lead-Off hitter, which is something they have not had since Tony Womack. In Eaton’s rookie campaign he hit .259/.382/.412 with 2 HRs and 5 RBI. Eaton only played in 22 games but he showcased all of his tools in his short amount of time especially his speed. 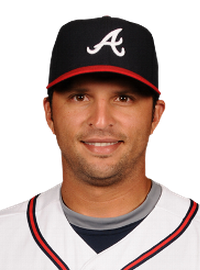 Martin Prado will be the starting 3B and will share time with newly signed Eric Chavez. I expect Prado to hit for a high average and hit plenty of doubles. The previous season Prado hit for a 3 Slash Line of.301/.359/.438 with 10 HRs and 70 RBI. He will also give Arizona stability on the hot corner. Arizona also signed Eric Chavez to back up Prado, because last season with the Yankees he showed some power with limited at-bats. He is a veteran who can come off the bench in late game situations. Aaron Hill had as good of a season by a 2B in MLB. He made tough defensive plays look routine every game and won the Silver Slugger award. Hill also did something pretty spectacular he hit for the cycle twice in the same season. This had not been accomplished since 1931 by Babe Herman. Hill also made history by becoming only the second player to hit for two cycles within one calendar month; this had only been accomplished by John Reilly in 1983. Tip O’ Neill also hit for cycle twice in 1887. Hill hit for a 3 Slash Line of .302/.360/.522 with 26 HRs and 85 RBI in 2012. It was his best season since 2009 with the Toronto Blue Jays. Hill hit for the cycle twice in the season. He joined Babe Herman,John Reilly, & Tip O’Neill as the only players to accomplish this feat in one season. Jason Kubel started his year off slow and then picked up his production late in the season. He also led all NL OF in assists with 14. Kubel hit .253/.327/.506 with 30 HRs and 90 RBI in 2012. He is one of the best RBI/per AB producers in the MLB over the last 3-4 years. Paul Goldschmidt is Arizona’s stud 1B who had a productive full first season. The one thing that is surprising about him is that for a guy his size, he has some speed. This is evident by 18 SB he got last season. The main thing he going for him is his power at the plate, he hit 43 Doubles during the 2012 season, the ball just makes a different sound when it comes off his bat. 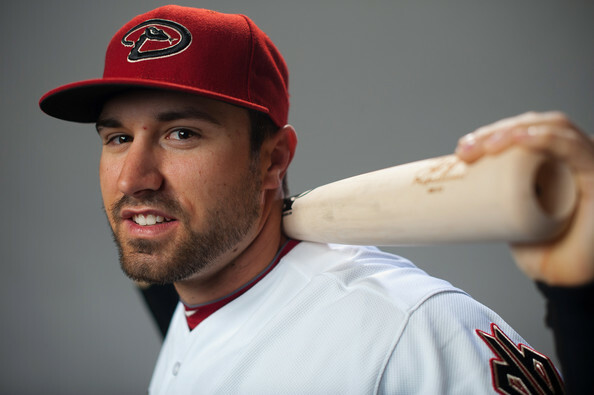 Goldschmidt hit for a 3 Slash Line.286/.359/.490 with 20 HRs and 82 RBI in 2012. Arizona also signed Eric Hinske to be a backup to Goldy, but also he is good bat to have come off the bench. Miguel Montero is turning out to be one of the more productive catcher’s in MLB. The offense has always been there, but recently his defense has improved especially his ability to throw out runners. He has a caught stealing percentage of 42%. Montero hit for a 3 Slash Line of .286/.391/.438 with 15 HRs and 88 RBI. Cody Ross smashed 22 HRs, 34 doubles and had 81 RBI in 476 AB for Boston in 2012. He was a great pick up by the franchise. 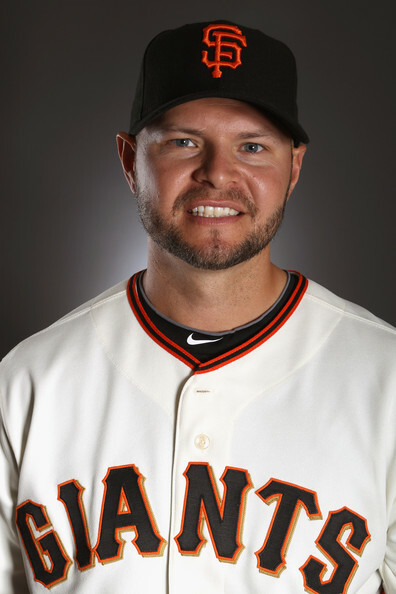 Cody Ross is Arizona new RF who should be able to hit for at least 20 HRs in Chase Field. Ross is solid defensively with the Boston Red Sox last season he had nine OF assists. A good thing about having Ross he experience with the division by playing for the Giants a couple of years ago. Ross hit for a 3 Slash Line of .267/.326/.481 with 22 HRs and 81 RBI in 2012. 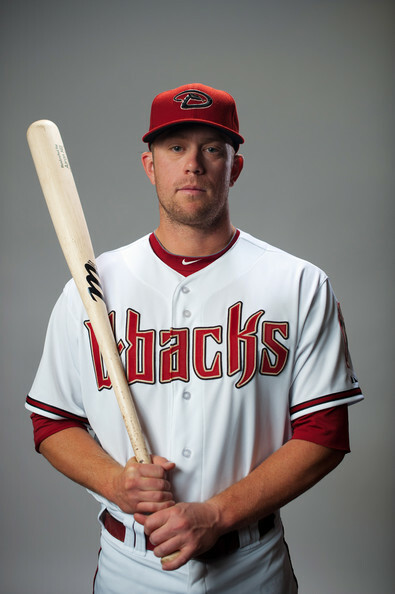 Cliff Pennington will get time at SS as will Willie Bloomquist, and John McDonald as well. Another person who has a shot is newly acquired Didi Gregorius. Arizona got him with the three team deal between the Cincinnati Reds, and Cleveland Indians. He is known for playing solid defense, but his offense is not quite there yet. I expect he will start the year in AAA, unless he does something to impress in Spring Training. Pennington hit for a 3 Slash Line of .215/.278/.311 with 6 HRs and 28 RBI in 2012. With all of these things considered I fully expect the Diamondbacks to be in the hunt for playoff spot in this ultra competitive division. Diamondbacks fans can expect to see this team return to the playoffs with help from their young players and veteran players on the bench. Ian Kennedy had a breakout season in 2011 with 21 wins. He will need to bounce back from his 2012 season and be the anchor of this pitching staff. Posted on February 16, 2013, in MLB Payroll and Contracts, The Rest: Everything Baseball and tagged 2001 world series, 25 man roster Arizona DBACKS, @aecanada12 on twitter, AAA Reno, aaron hill, Adam Eaton, arizona diamondbacks, Atlanta Braves, babe herman, brad ziegler, brandon mccarthy, braves. atlanta, bryce harper, chase field, chris johnson, chris lacey, chris young, cleveland indians, cliff pennington, cody ross, colorado rockies, daniel hudson, david hernandez, Diamond Backs 40 Man Roster, didi gregorius, eric chavez, eric hinske, gerardo parra, heath bell, ian kennedy, j.j. putz, jason kubel, john mcdonald, John Reilly, justin upton, kevin towers, los angeles dodgers, martin prado, matt reynolds, miguel montero, national league, NL ALL-Star, NL Silver Slugger Award winner, nl west, oakland athletics, Patrick Corbin, paul goldschmidt, pittsburgh pirates, randall delgado, ryan wheeler, san francisco giants, Tip O' Neill, Tommy John Surgery, Tony Sipp, tony womack, trevor bauer, trevor cahill, tyler skaggs, wade miley, willie bloomquist. Bookmark the permalink. Leave a comment.